In 2007, Frank Smith, a retired secondary school visual arts teacher in Toronto and a well-known local artist, travelled to Tanzania as part of a Rotary International group, helping to rebuild and renovate schools and hospitals. At the same time Frank couldn’t help but notice the problems being faced by the local children of school age who in many cases were being cared for by relatives, having lost one or both parents to HIV/AIDS. 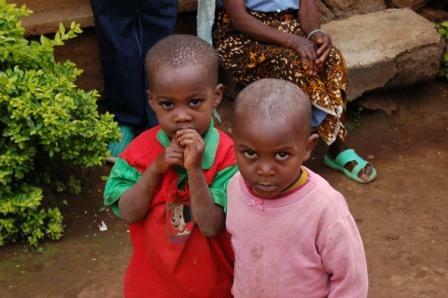 Frank returned to Tanzania in early 2008 with Rotarian Lynn Bird. Their aim was to get local children to create art that would describe their dreams for the future. Thirty children took part in the initial project in the Kilema and Marangu West area at the foot of Mount Kilimanjaro. In every case the child wanted to finish school and engage in jobs within their community.They wanted to be doctors, teachers, nurses, bus drivers, store owners and farmers. They all had dreams of helping themselves, their families and the community. In 2009, Ken Wall introduced the concept to friends and colleagues in Australia, and through the Rotary Club of Templestowe, Melbourne, Australia, ABCD: Art Building Children’s Dreams (Australia) Inc. was created. Following the inspiration of Frank Smith and Ken Wall, John de Ronde has created ABCD: Art Building Children’s Dreams (UK), an independent incorporated association. His hope is that he will be able to raise funds for the community of Lyamungo Sinde to help the orphans and otherwise vulnerable children. His vision in the village is to set up a fund for the orphans, to help children from the very poorest families go to school by paying supplementary school fees, supplying books and uniforms and even food if necessary through a subsidised school lunch programme. He would also like to provide a post-primary training facility for them so they might learn a trade. Our aim is to replicate the ABCD projects as far and as wide as possible, so that more and more children around the world can afford the education that could provide the key to their future – and the future of their families and communities.